My first blog post about Ron Sproat was episode 239, back in May 1967, and since then, I have been involved in an entirely one-sided war with the man. The major complaints about Sproat’s writing are as follows: he adds tons of time-wasting filler, he thinks the characters should recap constantly, and he writes flat, functional dialogue that makes every character sound the same. For more information on Ron Sproat’s many failings, please see pretty much everything I’ve ever written about Dark Shadows. But no more! After today, Ron is gone and I never have to watch another Sproat episode ever again. Now, I’ll admit that I was a little nervous as I approached this milestone. If Sproat somehow managed to pull a good episode together for his last show, then it wouldn’t feel like an appropriate conclusion for my Sproatnapped posts. 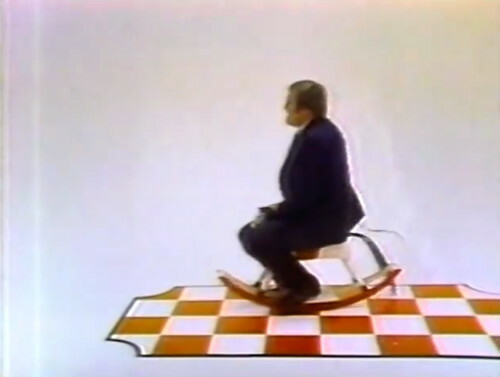 But, lucky me, Ron Sproat does not disappoint, in the sense that this is another infuriatingly bad episode, and for that, I must admit, I am grateful. Barnabas: That’s what she said. Julia: Who could have murdered her? Julia: But didn’t she say? She didn’t give any indication? Barnabas: I’ve told you everything she said. Julia: Well, tell me again. And that is basically the mission statement of a Ron Sproat script: We have nothing interesting to say, but let’s say it again anyway. They’re talking about the seance from yesterday’s episode, which was also written by Sproat and didn’t accomplish anything. Barnabas and Professor Stokes teamed up to contact the spirit of Madame Findley, the freelance occult expert who came by a couple months ago to see if there was an evil spirit loose in Collinwood that wanted to murder people. I forget if she ever found out. She ended up tumbling down the grand staircase to her death, and nobody had the heart to ask her for a final report. Unfortunately, that’s 145 characters, so the message didn’t even go through. The whole thing was just a waste of good candles. 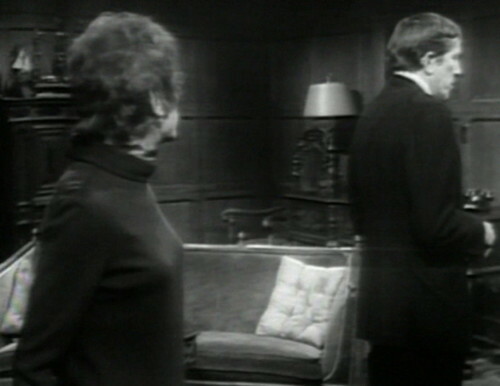 Julia says, “Yes?” and then Barnabas walks all the way across the set and opens the drawing room doors. He gives the foyer a quick once-over, and then he comes back into the drawing room and closes the doors again. Then he walks back to Julia and continues the conversation. 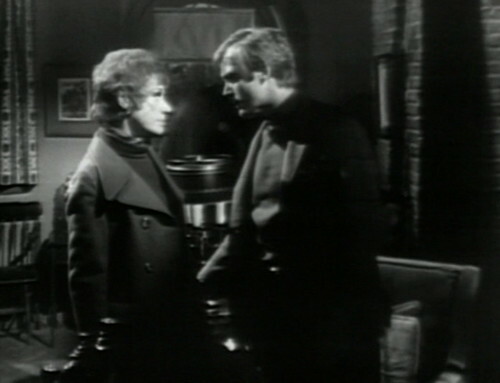 And I have to say, that is a cynical way to fill screen time, even by Dark Shadows standards. The show has only been on for two minutes and fifteen seconds, and we’re already doing pointless perimeter checks. But just wait until you hear what the three possibilities are. Barnabas: First, the children are in some kind of danger, and Madame Findley wanted us to know about it. Or — that the children knew who the murderer was. Banabas: The third seems incredible… but it could be a reason why Madame Findley wanted us to know about the children. Barnabas: The children themselves killed Madame Findley! That’s enough to get us into the opening titles, and when we come back, there’s a breathless splutter of dialogue. Barnabas: I told you it would seem incredible. Julia: Well, it certainly does. Why would they do it? How would they do it? Barnabas: I don’t know, which is why I tend to discount the possibility. And then they just start talking about something else. That is the entirety of the “maybe the children killed her” portion of today’s program. 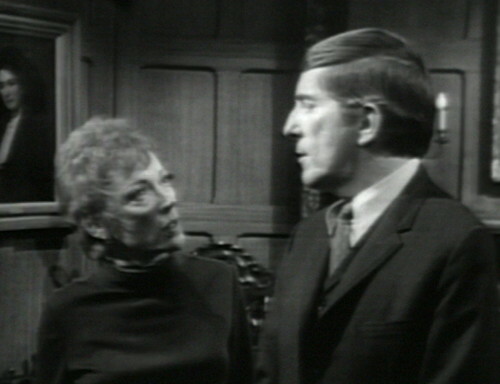 Now, as we all know, Jonathan Frid often has a hard time remembering all of the words that he’s supposed to say, but I think Ron Sproat episodes are the hardest for him to cope with, because Sproat characters just talk and talk, and never really get anything done. So the ship runs aground, and honestly, there’s nothing like a good chunk of Fridspeak in the middle of a Sproat scene to make you re-evaluate your feelings about the sanctity of human life. Julia: Have you questioned them? Julia: Well, aren’t you going to? Barnabas: Well, I don’t think that — (looks at teleprompter) — I can get either of them to — (starts shuffling around the set) — to admit anything. David is — (looks at the floor) — is too, too clever. (looks at teleprompter) But I want them to — not — be suspicious. Of me. Julia: Amy’s alone in her room now. Why don’t you talk to her? Barnabas: I don’t think that would be very wise, Julia. 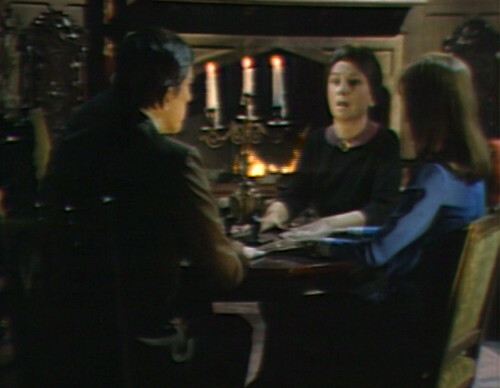 Julia: But, Barnabas, of the two children, I think Amy would be the one to talk to. And then he starts looking at the floor again. Well, as you might expect, the “let’s interrogate Amy” sequence is a real barn burner. Barnabas: Did you ever talk to her? Barnabas: What did she say to you? Amy: She asked me a lot of questions. Barnabas: What kind of questions? Barnabas: Well, can you give me an example of one? Amy: I don’t remember any of them; I just remember that she was here, and then we talked for a while, and then she went away. And history repeats itself, apparently, because Barnabas and Amy talk for a while, and then Amy goes away. So now it’s Julia’s turn to serve. Julia: There’s someone else we have to go and talk to. 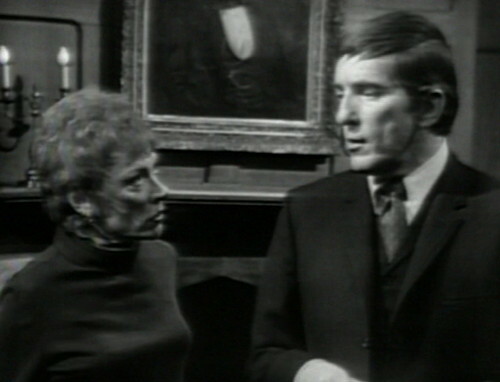 Julia: Barnabas, I keep thinking of that strange woman who came into my room, and led us to him, while Chris was dying. Chris might know something about her, something that could lead us to clear up the mystery in this house. There might be a connection. Barnabas: Oh, Julia. He said he knew nothing about her! He already told us that. Ah, yes, but this is a Ron Sproat episode, and if somebody already said something, then that means it’s time for us to go and ask him to say it again. This is how Sproat builds tension, in the sense that the entire audience develops a collective migraine. And it just goes on like that, for scene after scene. Chris says he doesn’t know anything about the strange woman, but Julia breaks out the medallion, and says that maybe he’ll remember something under hypnosis. This is the result. Julia: I want you to tell me what you know of a tall, blonde woman in a long, flowing white dress. Do you know her? Julia: Do you know such a woman, Chris? Julia: Do you know her? Julia: Think. Concentrate! A tall, blonde woman in a strange, pale flowing dress. You never saw her? Julia: You know nothing about her? So Julia says, “It’s no use,” and snaps her fingers, breaking the trance. Chris comes out of the trance, and now we have to recap the dull scene that we’re currently in. Julia: I hypnotized you, and we talked. Chris: Did I tell you anything? Julia: No. I don’t think you know anything about the woman we saw. Chris: Oh. I was hoping I did. And against all odds, they manage to keep talking about it. Barnabas: We may as well go back to Collinwood, Julia. We’ll see you later, Chris. Chris: Yes. I’m sorry you didn’t find out anything. Believe me, I’m as disappointed as you are. Julia: I believe you, Chris. So I’m sorry, I know at this point I’m just quoting boring dialogue in order to show how much boring dialogue there is, but it honestly feels like it’s intentional, like Sproat is deliberately crafting scenes that call attention to the absence of any meaningful content. The characters keep saying things like “It’s no use,” and “He already told us that,” and “I’m as disappointed than you are.” I think Ron Sproat is trolling the audience. This episode is actually one of the major turning points in the history of Dark Shadows, but it’s the sad, quiet one that nobody noticed at the time. The other turning points are big, exciting events like Barnabas’ introduction, Julia offering to cure Barnabas, and Jonathan Frid’s first big publicity tour. Ron Sproat leaving the show is just as important, because they’re finally getting rid of the guy who thinks that Dark Shadows was better before the vampire came along. This episode, dull as it is, completes the cycle that began all the way back in April 1967, when they opened up the mystery box and released something magical and strange. For almost two years, Barnabas, Julia, Angelique and Sam Hall have been swimming upstream, fighting against the current of traditional soapcraft to create something that nobody ever expected. When Ron Sproat leaves the show, Dark Shadows is finally free to create fast-moving, character-driven stories, featuring a cast of mad, extravagant eccentrics. Tomorrow is the first day of the rest of Dark Shadows. It is magnificent. 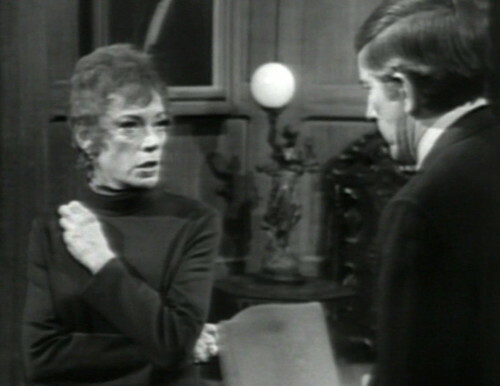 Tomorrow: Barnabas Collins and the Mysterious Ghost. When Julia is spinning the medallion, she tells Chris, “Just keep looking at it, and listen to my voice. Do you understand?” And then she coughs a couple times. 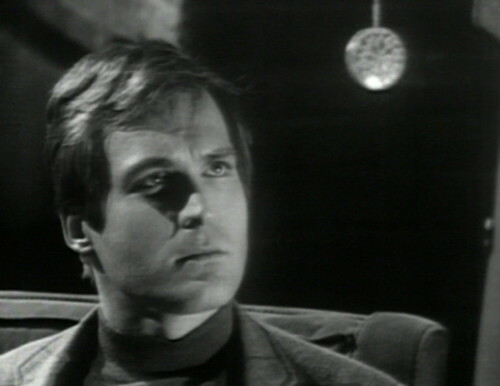 After Dark Shadows, Ron Sproat wrote for a syndicated Canadian soap opera called Strange Paradise, which ran for 195 episode during 1969 and 1970. 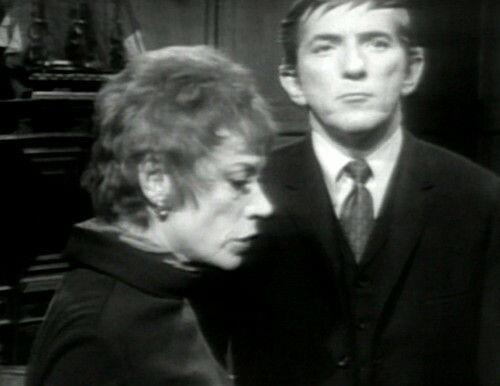 The show was heavily inspired by Dark Shadows, with storylines about witchcraft, possession and voodoo. The premise was that the characters were all trapped in a castle on a mysterious island. Sproat also wrote for other soap operas, including The Edge of Night and Capitol. 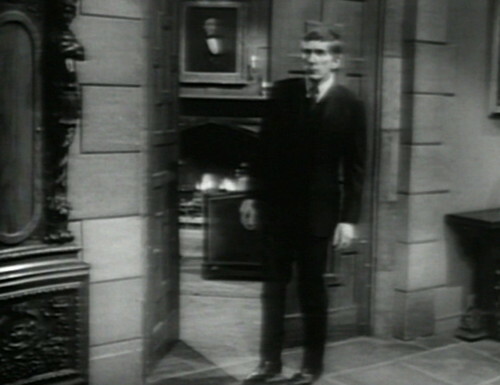 This episode was skipped when Dark Shadows aired in syndication after the show was over. The video master was damaged, and they didn’t realize there was a black and white kinescope copy. MPI found the kinescope when they started putting out Dark Shadows on videotape in 1989. Just imagine how delighted everyone was when they finally saw the “lost episode”, and it turned out to be this. There are four more black-and-white kinescopes coming up; the next one is episode 797, from July 1969. We were murdered! And someone is responsible! It’s Harold Pinter with a head injury. We’re about two weeks from 1897, so it’s interesting to watch a Sproat episode, which could easily have been skipped without missing anything. That won’t be the case soon. In fact, in a few months, if you missed an episode, you might actually be somewhat confused by what’s happening. 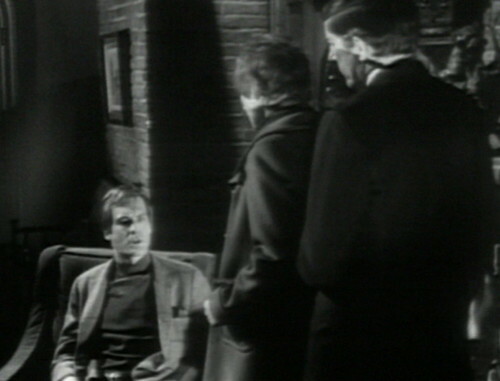 Some claim that had a detrimental effect on the series because soaps were designed for somewhat casual viewing — you could catch 2 -3 episodes a week and still keep up. However, I think there’s an art to maintaining viewer interest under those circumstances, and Sproat never achieved this. This episode, for example, never even bothers with entertaining red herrings or false progressions. 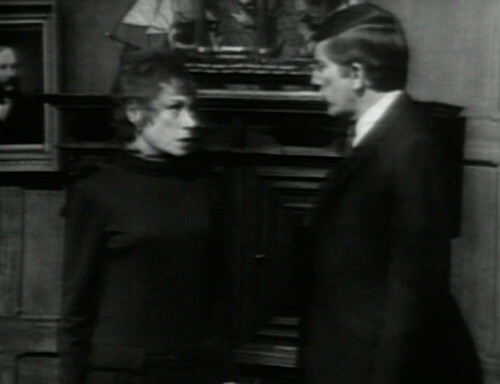 There’s zero tension: Amy doesn’t deliberately send Barnabas and Julia on a wild goose chase by claiming Madame Findley said something that might throw suspicion on anyone else. 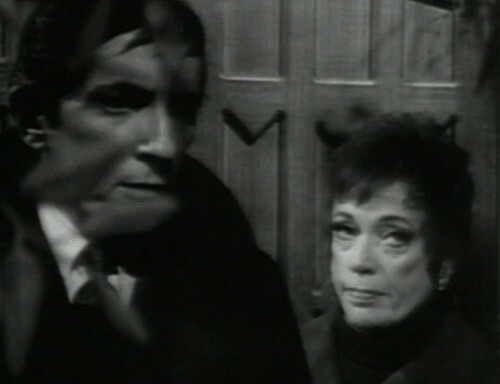 Dark Shadows stories may have eventually moved to fast for the audience to keep up with it back in the day, but I think that same quality is what also keeps the show re-watchable now. I agree. I recall that when the series was first released on VHS, most of the Jason McGuire blackmail plot (at least the more plodding elements), were edited out. When I rewatched them all on DVD, I realized I was just skipping through them anyway. 1897 is almost a complete series (184 episodes) in itself — but airing over just 9 months. I saw “Turn-On,” but unfortunately (or perhaps fortunately) I remember little about it, save that it was unbelievably lame. It got a lot of hype, since it was the brainfar… er, brainchild of the guys who gave us “Laugh-In.” It was completely unstructured, even by “Laugh-In” standards. The only thing I remember clearly is the final portion of a fake news report, when the reporter signed off and the camera pulled out to reveal he was wearing jockey shorts. Ha, ha, ha!! He’d been doing the report in his underwear! Ha, ha! I almost didn’t remember that I remembered it. It was THAT memorable. Almost. Correction: in his underpants. I recall we had only seen the reporter from the waist up prior to that hilarious reveal. Computers must find reporters in their underpants pretty hilarious. I don’t recall the show being all that dirty, but likely I was too young to catch the word play. Imagine an era when being highly suggestive could get you yanked off the air. Sorry I have to be the dissenting juror – I will miss Ron Sproat – but I have the utmost praise for the current (and new) writers – I especially enjoyed the Violet Welles storylines.. So. At least, you’re half right. I’m in 1897 now, yes I jumped ahead, and happy, cuz there’s lots of Violet there. Never heard of Turn-on. What a fun fact! Bye bye Ron Sproat!! I’ll miss your jabbing at him, Danny! Like or dislike him, Ron Sproat’s legacy with Dark Shadows is secure. He created the Barnabas character when Dan Curtis thought, ‘What the hell, we’re facing cancellation anyway, let’s go out with a bang; my kids want to make it scary, so let’s bring a vampire on the show’. 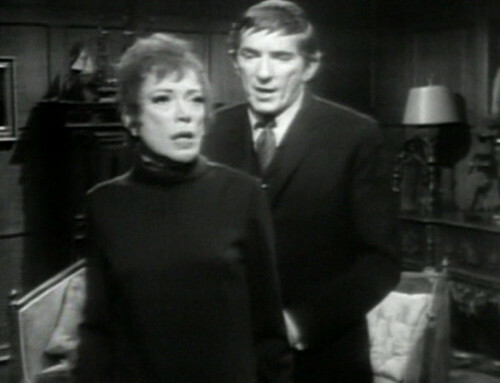 What’s more, because Sproat was at the Yale School of Drama with Jonathan Frid, Frid was able to consult with Sproat as to how the character should be written. “Don’t write me spooky,” Frid advised his old fellow Yale alumnus. Had there been anyone else in that position, Frid might not have been able to get his way; he might have instead been compelled to do it Dan Curtis’ way, playing it spooky and cold rather than tormented and conflicted, and his impact with viewers might not have been so huge. In fact, Barnabas would have been killed off in a matter of weeks, the show would have been cancelled as planned that summer, the 200 plus master reels of Dark Shadows would have been wiped and reused by ABC, and we wouldn’t be talking about, let alone still watching, the show some 50 years later. So, Ron, wherever you are, thanks for your contribution and thanks again for saving my favorite show. POTN……You have turned me around. I never could have considered it that way. Two paragraphs, and you made me like him, I mean, his impact. This is not a snarky post…. When people form history that you enjoy, you must give them their props. And take it in stride, when the dull happens. Who knows? What he went through? Could have been awful….. So. Here I am. Saying Thank You, because it may not have happened without you, Ron. I’m thinking of writing a two-paragraph book called, “My Memories of ‘Turn-On. '” Even at two paragraphs, I’d have to insert a lot of filler. Here’s two short paragraphs, not even that. Is Violet Welles an alter ego of Sam Hall? Could be a pen name for Grayson, too. Turn On. I guess I missed that completely. Good history lesson. Was very into Laugh-In and Lily Tomlin, from day one, and The Flip Wilson Show, with Flip as the fabulous Geraldine. Turn-On does not ring a bell. Sounds like the most deconstructed show, ever. It was a time when Warhol, Picasso and Dali were still alive. It’s kind of fitting that Mr. Sproat’s last episode only exists as a black and white now. 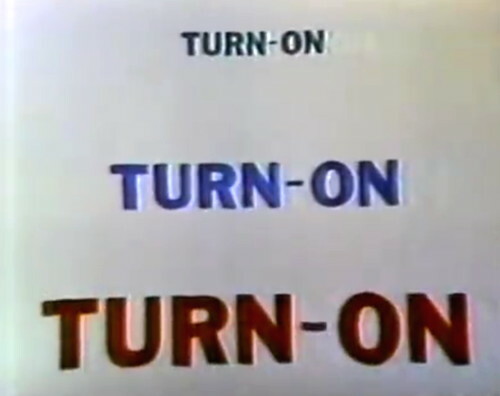 I remember watching “Turn-On.” I would have been 9, almost 10 years old. I watched it no doubt because it was by the “Laugh-In” creators, and I liked “Laugh-In.” I also don’t remember any sexual innuendo or sexual overtness, but, again, I was a kid and it probably went over my head. The only specific thing I remember is that there was a Muppet-like character (at least that’s how I remember it) who was a cop and got blown up for some reason. He reappeared all bruised and bandaged and said something. No doubt it was playing into 1969 anti-cop sentiment. Now I know why I could never get into “Strange Paradise.” They just stood around and talked over and over about the same stuff, and the plot never seemed to advance. It was like watching the paint on the wall dry. Thanks for bringing Ron Sproat to my attention. I must admit I never really thought about the dialogue before, but after reading your posts, I have become more aware of the repeating and recapping. I was in the tv audience for “Turn On” as well. Probably because I liked “Laugh-In”, too. I remember the disconnected, rapid-fire pacing more than anything specific. It could be seen as a precursor to MTV, which was of course orders of magnitude more successful.